It's cheap - I'm on my second one. The first was a hand me down which broke (sort of, the outer casing came off) after a few years of use. The second, purchased a few months ago at Le Gourmet Chef outlet for $8. The current one seems to be made better where there is no outer casing (Misto must have fixed a common problem) so I think it will hold up better. Cheaper than continually buying cooking spray. It's easy - fill it up half way with olive oil (or any kind of oil) pump and spray. Olive Oil is my go to cooking oil. It's fun - pump it! give it a few pumps and spray away - sprays just like an aerosol can of cooking spray would but without the aerosols. It's healthy - although olive oil is a healthier option than most types of cooking oil, it's still easy to go overboard when cooking with it. The spray helps control the use. 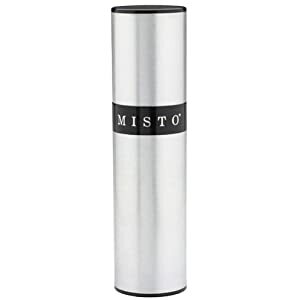 I use the misto on anything from coating a baking pan to using on sauteed veggies. Another tip, if you buy plain old non-buttered, no-salt popcorn, spray some of the misto and it's much better than lathering up with real or fake butter. This also makes a great gift combined with some fancy olive oil or balsamic. Shariously, you don't want to missto this one!